Kumho T121 Temporary/Compact Spare tires was developed for Original Equipment applications that allow vehicle manufacturers to increase available space and reduce overall vehicle weight compared to using full-size spare tires and wheels. In the event of a flat tire due to a puncture, cut, road hazard, accident or blowout, T121 spare tires are designed to help drivers regain temporary mobility. 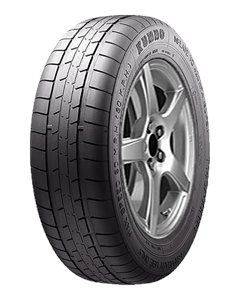 Like all Temporary/Compact Spare tires, Kumho T121 spare tires are designed for temporary use only. They feature smaller physical sizes, narrower treads, shallower tread depths and lighter-weight constructions than the tires with which the vehicle is normally equipped. The smaller physical size requires the Kumho T121 spare tires be maintained with 60 psi cold tire inflation pressures and driving speeds restricted to 50 mph maximum driving speeds. Temporary/Compact Spare tires do not include a wheel. Check your vehicle’s owner’s manual for recommendations and restrictions.